On 18 February 2011, the day after Sri Nityananda Prabhu ́s appearance day the long awaited decision pertaining the appointment of land for a new temple in The Hague, The Netherlands, was made by the local Dutch governing authorities in favor of ISKCON and other religious organizations. A consortium of three religious organizations, International Society for Krishna Consciousness, Arya Samaj Nederland and Siri Gurudwara Singh Sbha will be building three temples side by side. The temples are linked together and interspersed with two towers, each with 45 apartments. This million Euro project will be funded by the organizations with no financial aid from the government. Alderman Marnix Norder (city development, integration) released an official statement to the media where they stressed the fact that the financial funding will be a private endeavor and the municipality has only authorized and allotted the land for this project. 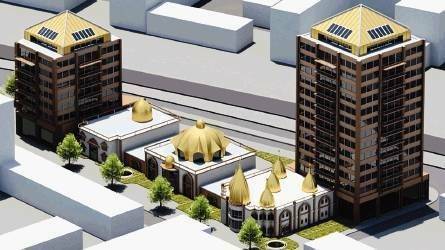 He believes that this complex will be an icon for the city of The Hague and The Netherlands in general and will be the second largest temple complex in Europe, after the UK. These temples will be a major tourist attraction with residential towers to facilitate not only Hindus, but everyone. The complex will have meditation facilities and guestrooms for (foreign) guests and visitors. Council member Rajesh Ramnewash launched this plan one and a half years ago. The complex should open in 2014.